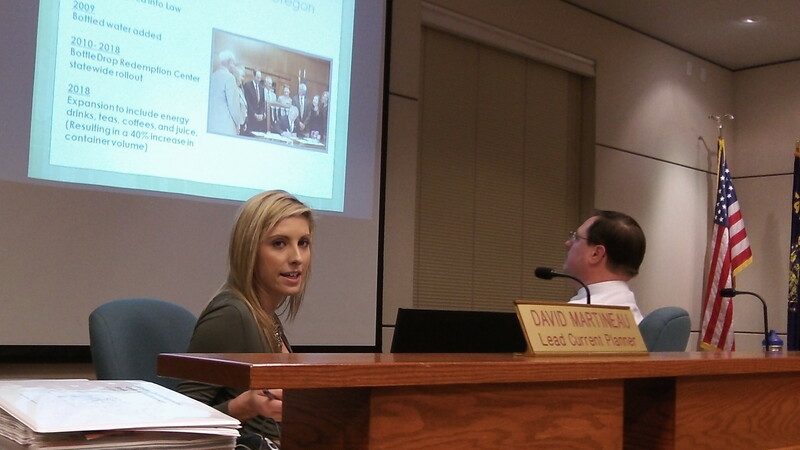 Stephanie Marcus makes her presentation as planner David Martineau watches. 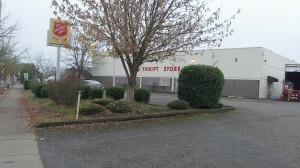 The old Salvation Army thrift store, which closed years ago. Planning commission members Dala Rouse, Roger Phillips, Kristin Richardson, Larry Tomlin, Lolly Gibbs and Danon Kroessin voted to endorse the main part of a request by the Oregon Beverage Recycling Cooperative to amend the zoning code. The change would allow a bottle and can redemption center in the “main street zone,” which includes the former Salvation Army thrift store at 1224 Santiam Road S.E. The cooperative wants to buy the long-vacant building and remodel it as a center where people take their returnable containers and get their deposits back. Stephanie Marcus of Portland, coordinator for property acquisitions for the cooperative, said she’d like Albany to be one of the cities where the organization opens a center or “bottle drop” this year. The city council will hold a public hearing on the zoning request on Feb. 12. If it approves, the cooperative then will seek a permit from the Oregon Liquor Control Commission, which administers the Oregon Bottle Bill. As approved by the legislature, redemption centers relieve participating stores within 2 miles from handling empties. All Albany supermarkets are within 2 miles of the Santiam Road site; only Walmart is just outside and would still have to accept empties, but it could limit the number to 24 per person per day. The redemption centers run by the cooperative are indoors and kept clean, according to Marcus. They are staffed seven days a week and can accept up to 350 containers per person per day. To get refunds right away, customers can have empties counted by the staff or feed them into machines themselves. Or they can drop them off in coded sacks and receive a credit. Thank you for stepping up and voicing your support for the redemption center. Oregon Beverage Recycling Cooperative is funded by the grocery stores for THEIR convenience. We are expected to make an extra trip to a recycling center when we still have to go to the grocery store anyway. HOW “environmental” is that? People without a vehicle, can take a small amount of cans/bottles each trip to the store without much inconvenience. To justify a trip to the “recycling center” means people will be packing huge leaf bags full of recyclables on the city bus, walking in the roads where there are no sidewalks and generally being a pain, myself included. I personally would have to make a 2 mile trip in the opposite direction of the grocery stores. The Oregon Beverage Recycling Cooperative’s “job” appears to be providing solutions for a non existent problem in order to justify growing larger and enhancing THEIR political power. IF the stores sell the item, make THEM take it back at the same place of business!